Letters From A Tapehead: Shout Out Out Out Out: "Now That I've Given Up Hope, I Feel Much Better"
Shout Out Out Out Out: "Now That I've Given Up Hope, I Feel Much Better"
One of the most infectious tunes I've heard so far this year is "Now That I've Given Up Hope, I Feel Much Better" by Shout Out Out Out Out, a rather jovial instrumental based in the sound of David Bowie's Low and the spacier loops generated by Neu! or Can. It's bouncy, synthesized vocoder rock music that enjoys its groove, embraces its joyful sounds next to its defeatist title and latches on. 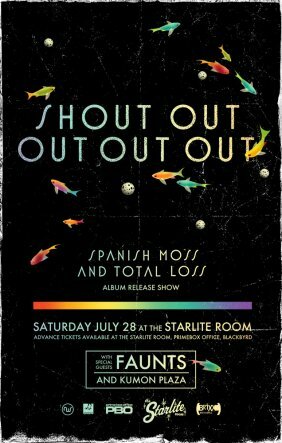 Shout Out Out Out Out's new album, Spanish Moss and Total Loss, which is a tad uneven, but still worth a listen, is streaming now via the links below which were provided by Terrorbird Media. 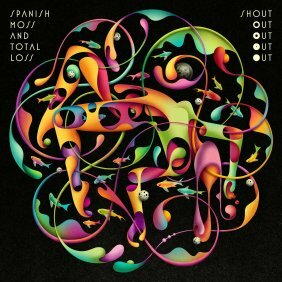 Shout Out Out Out Out's third full length album since forming in 2004, Spanish Moss And Total Loss, finally hits stores today in North America courtesy of Normals Welcome Records. The album is streaming this week in full at Exclaim! as well as Spinner, so now is your chance to catch up if you missed out initially. The Edmonton, AB-based six piece -- consisting of Nik Kozub, Jason Troock, Lyle Bell, Will Zimmerman, Clint Frazier, and Gravy -- deliver their most melodic and textured effort to date, with parts of the album really treading new territory for them. Fans of the prior albums will have a lot to sink their teeth into, but with SO4 listening to a lot of Todd Terje around the recording of the new LP, new rhythms and stylistic shifts begin to emerge -- reflected in the kaleidoscopic final artwork for the album. MTV Hive recently premiered the album opener "Now That I've Given Up Hope, I Feel Much Better," which an oddly timed yet dancable beat that sets the rest of the album in motion. The band has announced a handful of Canadian dates, including the Keloha Festival and the Evolve Festival. 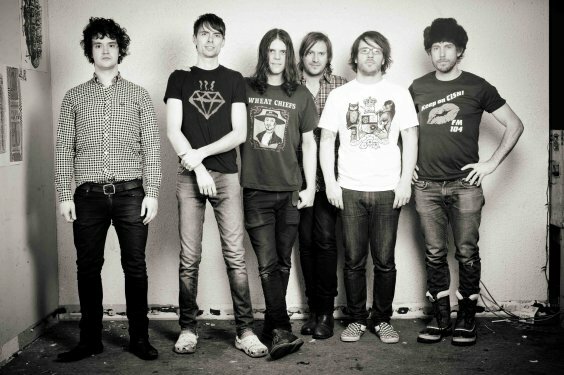 More details on an Edmonton record release show, as well as a US tour later in the year will be announced soon as well. 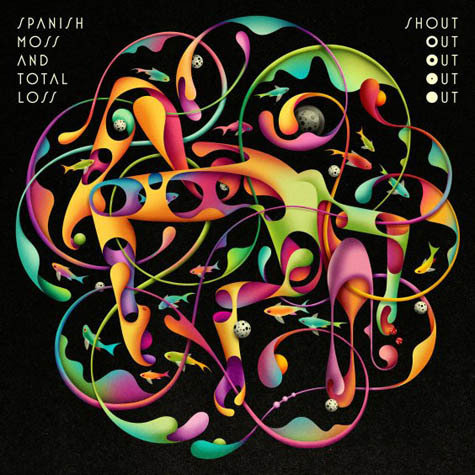 The new album shows Shout Out Out Out Out's growth as songwriters, with a strong melodic focus, and an expanded base of instrumentation. Their vast collection of analog synths has grown, and is featured very heavily, alongside saxophone, Rhodes piano, baritone guitar, and of course their signature double drummers, and vocoder laden vocals. The new album features a wider variety of tempos and feels than Shout Out Out Out Out's two previously acclaimed records, while still maintaining the dancefloor filling energy they are widely known for. The growing influence of Disco, Classic House, Krautrock and cosmic synth music are extremely present, with a hint of the punk ethic of the band's roots lurking in the shadows. Recorded at the new Audio Department Studio in the band's hometown of Edmonton over the course of 3 months using a wide variety of analog gear, Spanish Moss And Total Loss is a stunning and deep listen. "Welcome to the world of Shout Out Out Out Out. We do a lot of things ourselves, really. I produce and record our records, Jason and I run a small record label that releases our records, Lyle designs our website, Gravy takes our photos, Will and Clint provide youthful exuberance and comic relief, we all do our part. We live in Edmonton, Alberta, Canada. It's an alright place: cold in the winter, hot in the summer, people are, for the most part, friendly here (regardless of what our exceptionally high murder rate would suggest). There's not that much more to say about it really. I guess it is the kind of place where if you want to get anything done, you pretty well have to do it yourself, so maybe that's why I am here writing this. Our new album, Spanish Moss and Total Loss, was recorded over the course of 3 months in our hometown of Edmonton. We strongly feel that it is our best work to date (and so we should, what would be the point otherwise?). The album marks a bit of a departure from our previous material, or rather a natural progression. Since our humble beginnings in 2004, we have grown to be fully encompassed in the world of electronic music, and this is now our world and the way we think about things. We tried to write a record that we would all personally listen to, and a record that we would be proud to play as DJs (we do that too). This is our most ambitious production to date, expanding our previous instrumentation of two drummers and four bass players (with a mountain of analog synths), to include Rhodes piano, baritone guitar, saxophone, and well, even more synths.